Buy Sukrin Gold - sugar substitute in the UK from our online shop or directly from our independent Scottish store. If you want to automatically receive an email when 'Sukrin Gold 220g' is back in stock, just leave your email address below. The natural brown sugar alternative. Replaces sugar in baking, tea and coffee. Sukrin Gold, our all-natural sweetener and alternative to brown sugar - all of the aroma, sweetness and flavour without the calories, and 97% less available carbs than sugar. The first ever all-natural brown sugar-free sweetener with the aroma, sweetness, flavour and texture of brown sugar. Perfect in tea and coffee, over cereals, porridge and yoghurt. Makes baking and desserts sugar-free without compromising on taste. We sell real Sukrin and other Sugar & Sweeteners directly from our shop in Scotland and online throughout the UK. View more products from Sukrin. Where can you buy real Sukrin Gold 220g safely online? If you are wondering where you can buy Sukrin Gold - sugar substitute safely online in the UK, then shop with us. 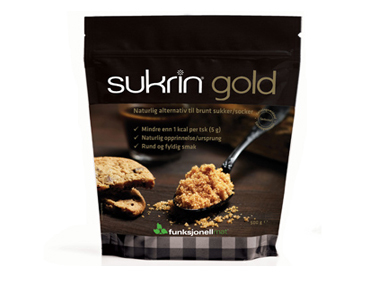 Sukrin Gold 220g - Sukrin Gold - sugar substitute in Sugar & Sweeteners and Foods.